It’s past the halfway point of the school year and becoming apparent whether or not your children are struggling academically. If they are struggling, there’s still time to turn it around. Unless they have special learning needs, the main issue is most likely organization and routine.There’s simply not enough structure and order to keep them focused and on top of academic requirements. And if left unchecked, the daily work demands, deadlines, and tests can become overwhelming. Things decline quickly from there. Luckily there are steps that can be taken, simple adjustments to turn it all around. It will require active input on your part as a parent. With that in mind, following are nine actions to take to help your children maximize their abilities and get the marks that best reflect their skills and knowledge. 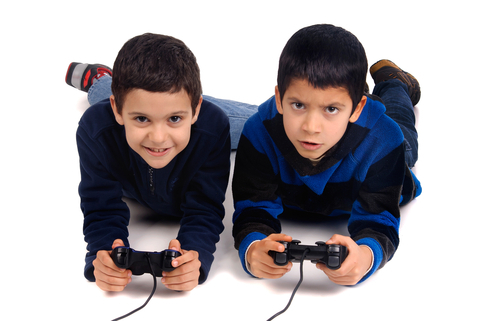 Ever noticed how tense kids get, particularly boys, when they are playing video games? All that energy shoots up through their hands and into their body and brain with no place to release it. When asked to do their homework, they do the bare minimum in the fastest amount of time in order to get back to their games. And if you as a parent dare ask them to do more, then they have found their place to release all that stress and adrenaline… on you. That turns into a recipe for disaster. So cut back on technology. It will take some time to strike a good balance. None from Sunday night to Friday after school is a plausible first step. While on the topic of technology, there should be no technology in children’s bedrooms, particularly a cell phone, when it is time for bed. That ever-glowing light and the tempting thought kids have that someone might contact them or they might want to contact someone is intoxicating. It can keep them up way beyond bedtime. Thus, remove the temptations. At bedtime, simply have your child turn in their cell phone, i-pad, and any other device that glows and keeps them awake far longer than is healthy. Right up there with water and healthy food, sleep is one of the most natural and effective performance enhancing “drugs” available. For children it takes on an additional importance because their bodies are going through a variety of physical and physiological changes. That is why they need between 9 and 10 hours of sleep per night. Eight is not enough. And forget about trying to catch up on sleep during the weekend. It doesn’t work that way. A consistent uninterrupted sleep pattern is essential, one where they regularly go to bed and wake up at the same time. We are well into the new millennium. Chances are, the school your children attend has online technology that lists upcoming assignments and tests. As a parent you have access to this in order to stay apprised of what is going on and coming up. Take the time to use it. Typically, when children come home from school, the school bag is dropped and all links to the school day are forgotten: homework, tests, papers to be given to parents. Then later that night or the next morning the alarm bells go off and chaotic panic ensues. In order to eliminate that, have your children empty their backpack right after school, removing anything from today and replacing it with what is necessary for tomorrow. Chances are, there are a few different subjects tomorrow, thus there is no sense to lug all nonessential material back and forth to school. There is no right or wrong time to talk to your children about school. When they come home. During dinner. Later in the evening. In the morning. They have their own rhythm and comfort zone for talking. Try not to be forceful. Like adults, kids normally do not like to be peppered with questions about school the minute they get home. Be quiet and patient and give them time to make the mental switch from school life to home life while they are organizing for the next day. You might be surprised at what they want to share when they are relaxed and ready. And listen when they talk about seemingly unimportant classes like P.E. or art or what happened on the playground. These topics are of great interest to your child so when they start noticing that you are listening to them they will be more willing to talk about other aspects of school. It is a give-n-take. There’s plenty of information about having kids find a quiet work place in their room or some other isolated spot in the house. However, many kids like to be part of the family and in the “traffic zone” of their family’s doings. Therefore, set up a work space where you can see what they are doing. That serves three purposes. One, you are there to answer questions. Two, your child does not feel isolated. Three, since most work nowadays requires computer access, you as a parent can be around to help keep your child focused and not net surfing or chatting or fiddling on the phone or i-pad. That is not helicopter-parenting. That is being realistic. Whenever asked, kids will almost always say they, “have no homework to do.” No, they are not lying. They just are not thinking… at least about school. That is why having a regular daily homework time is useful. Sitting at their homework station and taking out their books will remind them of what needs to be done. And if there really is no homework to do, homework time provides perfect quiet time to read or review or simply sit quietly and think. 30 minutes is ideal. If more time is needed, well then, more time needs to be used on those days. It might not be nice, but sometimes parents have to lower the boom. If your children are involved with one or two or three or whatever number of activities outside of school, it may be time to scale back. It doesn’t have to be permanent and activities shouldn’t be completely removed. Simply cut down for a while until your children get school requirements back under control. As a parent, make it a priority to become an active participant in your child’s education. Don’t be lulled into thinking that too much hands-on interaction is intrusive and controlling. After all, the school is not the sole guardian of their academic growth. To be sure, it takes time to strike a balance and that balance constantly changes. These are children trying to navigate their school life and their social life; much of it at the touch of a button. It is a lot of power and pressure; plenty of academic pressure, social expectations, and immediate technological stimulation pulling them. They need attention and guidance. Thus, as a parent turn on and take a more active role in your child’s learning. Help your children to step away from some of their external demands and turn off technology – especially at bedtime. That will help them tune in to maximize their potential as students. A more structured school routine will also bring about more peace and positivity in the house. As stated at the start, it’s not too late. By Dan Franch, March 2015. Dan is also a columnist and cartoonist for wort.lu/eng.